Yesterday a collection of couples from the boats here in La Parguera harbor clubbed together to rent a van and do some sightseeing. 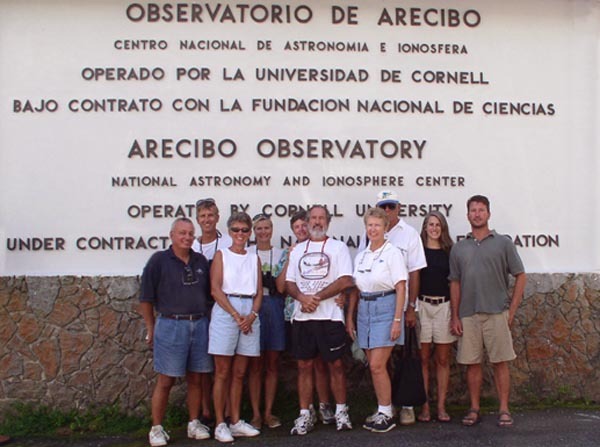 First we visited the world's largest radio-telescope in Arecibo, Puerto Rico. Left to right: Don & Marcy from First Light with Paul & Melinda from Daydream behind them; Reggie & Randy from Aditi; Diane & Richard from Jabulani; your own BG & Keith from Solace. This radio-telescope is best known for its cameo in a James Bond movie, either the Man with the Golden Gun or Goldfinger, no one is quite sure which. It's very cool, though everyone wished we visited seven years ago, when they still allowed visitors to stagger out the precarious and swinging suspension walkway to the telescope itself. You can see the very scary walkway below, in the upper right of the picture. 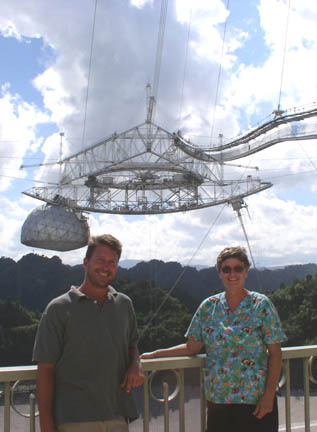 Keith with Reggie, Randy's girlfriend from Aditi, in front of the Arecibo telescope. The reason they're laughing is that behind Randy's new camera I'm sticking my tongue out at Reggie & Randy from Aditi. 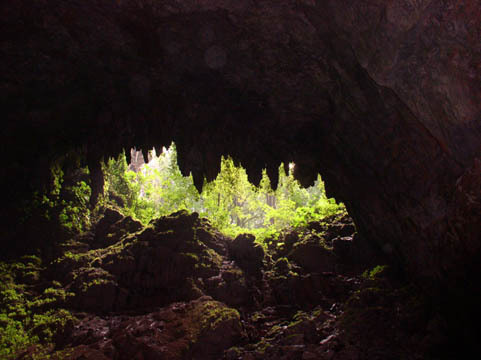 We also saw the famous caves of Camuy. 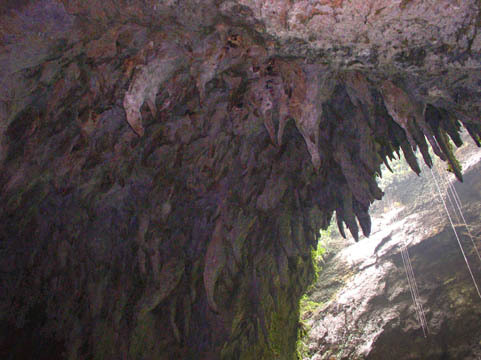 They were formed by the Rio Yunque, the 3rd largest underground cave river in the world. For some reason each time the guides say this, they also carefully tell us the names of the other two rivers, according to one visitor about twelve times by the time we're through the caves. We all notice this and think it odd but at the end of the day no one can remember either of them. 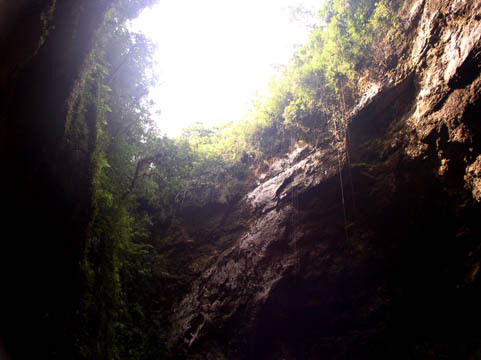 The Camuy caves are absolutely huge. 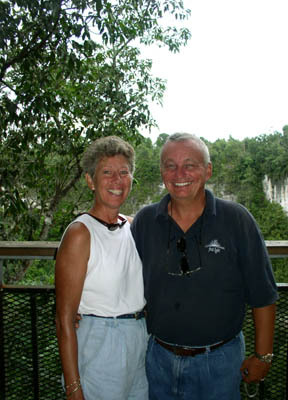 Keith, who went to grad school (business) in Arizona and toured many a cavern, says they're the largest he's ever seen. You go with a guide, who is very careful to lead the way on cobblestone walkways you're not supposed to step off. Pointing out some of the larger stalagmites, the guides tell us it takes 100 years to form a single cubic centimeter of rock. This seems barely credible to us, but we don't know much about rock. 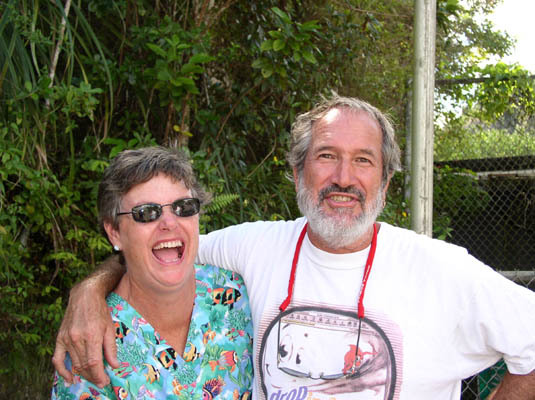 Above, Don & Marcy from First Light in front of the Yunque river, where it passes through a "sinkhole" outside Camuy. 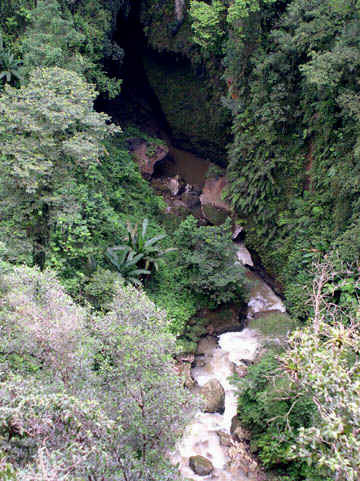 Left, the Yunque in the sinkhole. One of the spots where a rockfall created a new hole in the roof of the cave -- the rains made some new openings too -- glad we missed that. And another. If my ribs weren't broken, I would have tried to climb this when the guide looked away. Today we had a "traditional Thanksgiving dinner" on a small coral island outside our anchorage. I think it's Cayo Enrique, which in English would be. less romantically "Henry's Cay". Very strange to eat turkey and mashed potatoes and homemade cranberry sauce sitting outside in the sun. Keith, raised in Florida, is unfazed by this, but I find it quite disconcerting. My brother Paul and I always go for a long walk after Thanksgiving dinner, with or without other family members depending on general energy level, and since we grew up on Cape Cod, as we grew up it was quite often a walk on the beach. But we wore turtlenecks, heavy sweaters, hiking boots, and gloves. Here people are eating their turkey in shorts and Tevas and taking their after-dinner stroll in bathing suits. No pics because we're leaving tomorrow & won't have time to get them from Randy, but our new digital camera arrives tomorrow, hurray!